The design shows a high level of creativity with its wonderfully executed futuristic aesthetics. It also presents a nice balance of Bio mimicry and commentary on the modern lifestyle.The panel appreciated the beautiful form presented with the sculptural honeycomb module, however wished the structure was higher on the tree and provided a longer term private retreat but on the other hand liked the interpretation of a great short term relaxation and shared use space – a quick urban recharge cabin or pod.It is a well deserved winer with all taken into account and with such tasteful and clear presentation. A very intelligent communication of a concept that is convincing and realistic. The design is simple and mimics a place for relaxation. The interior space shows good staircase access running to the side. This design works very well with its tall and elegant form coupled with an interesting division of spaces and the rooftop deck. Access and stairs have been designed clear of the living space yet contained within the form with presence of the tree in all spaces. A solid work with clear and nice features compliment the functions that pop out of the vertical volume. In general, quite grounded to earth, however a few structural integrity issues to iron out to increase feasibility. 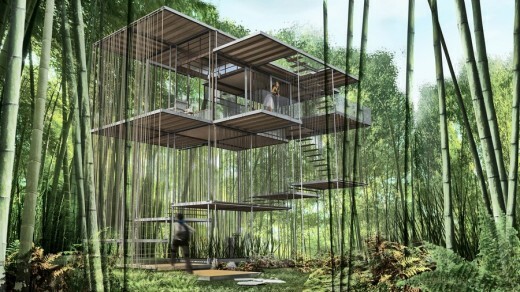 A minimalist structure with appearance of floating platforms and vertical screens that inter-play with the surrounding bamboo shoots and undisturbed view.It is a very interesting use of openness in a design and excellent gradual access. The panel would have preferred a different choice of material to improve engagement with the surrounding natural environment and improve the perceived lightness. However, the choice of bamboo growth and scaffolding-like structure with thin vertical bearing elements works very well and presents a project that is flexible, economical, realistic and achievable. The design shows a good use of space. It mimics the surrounding peaks of the mountains interestingly and fits in with the environment. Good use of wall space with climbing wall and very clear presentation. 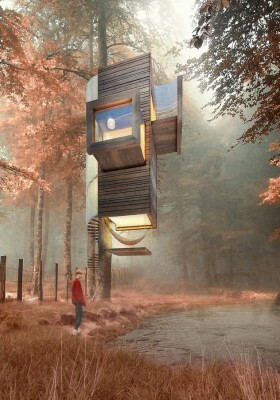 This project response to the brief directly and rather well in terms of a place for a couple to relax as a recharge cabin. This design is very creative and presents great application of bio mimicry, but it could do with improvement on the aspect of interior space use and scale. The panel liked the way the wasp nest inspiration is carried throughout the structure with good structural details, 360 degree glimpses through the pockets of windows.A very eye catching, recognisable and convincing structure, however the integrity of the design could have been better maintained with a tidy access method such as access from within to sustain the purity of form. 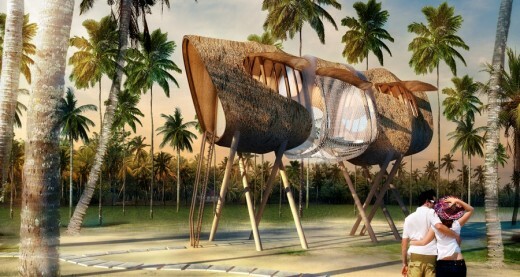 This structure appears more as direct architecture interpretation that is built in a tree rather than a tree house in the common sense. 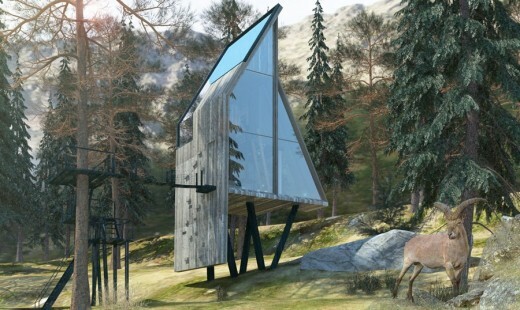 It is a very good suggestion for an architectural solution with it’s slanting stilts, split levels, stairs and ability to respond to any kind of tree almost independently. The project may lack uniqueness aesthetically and question may be raised about the tall spindly steel columns, however its horizontal and linear orientation of different modules in contrast to the flowing organic form of the tree gives this project a unique edge. Excellent design and aesthetically convincing with its crystal shape and origami related shell. The Panel thought the interior lacks space but this can simply be rectified with overall increase in the design size.A nicely presented structure but will need more structural support and clear indication of user access. The design presents an interesting proposition with the choice of a centre cradle and material in an attempt to blend well with its surroundings. It is somewhat organic, yet with a well defined form and feeling of the space from within. It can serve as a flexible design prototype for other models, however the stability, cost and building process is something that might raise concerns. Project chosen for the Directors Choice Special Ambience Award for its placement in the natural surrounding, lighting effect and playful but balanced arrangement, use and combination of the familiar geometric cubic form as sculptural building blocks for a maze of discovery through its spatial distribution. 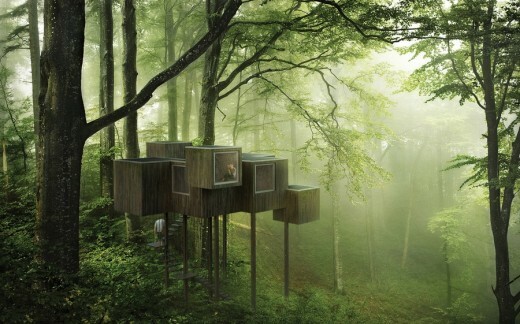 The juxtaposition of the predictable adaptable geometric cubic structural components with its controlled grainy exterior finish and the unpredictable protective organic trees with its rough blemishes all evenly bathed with the sun rays gives the entire presentation a unique and dreamy atmosphere.This is a project that has used the natural lighting through the trees to such great atmospheric effect to suggest and evoke a strong sense of a hideaway and secret escape. 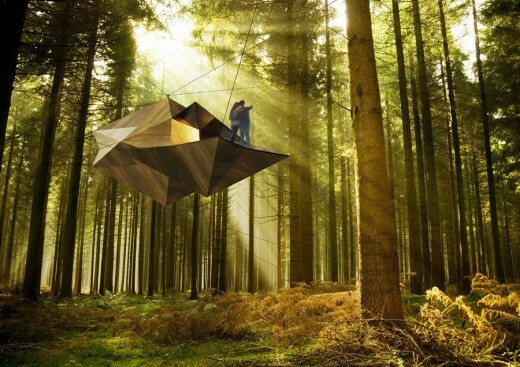 Triumph Architectural Treehouse Award 2014 images copyright attributed to project authors.